Let’s just say that the French have a way with potatoes. They got that down. First, they gave us the most popular side dish ever: French fries. How many of you can eat a burger without fries? And now they’ve joined forces with Canada to give us poutine, which is actually now Canada’s national dish. It’s also a popular, must-have dish here at DogHouse Pizza. Poutine is a greasy – (yes, we said greasy, which of course adds to its charm), yummy French-Canadian classic dish made with thick cut (or Belgian-style) French fries, gravy, and melted cheese curds, which is basically cheddar cheese before its aged and formed into blocks. Delish. Anything smothered in gravy is a beautiful thing in our eyes, and especially this dish. To folks from the northeast, poutine may look similar to disco fries — but there’s a big difference. Disco fries use shredded mozzarella or cheddar cheese, while poutine is topped with cheese curds. What’s the Origin of Poutine? That’s a million-dollar question because there’s no one clear answer. But here’s the traditional story. Poutine originated in the 1950s at a restaurant in Warwick, Quebec. 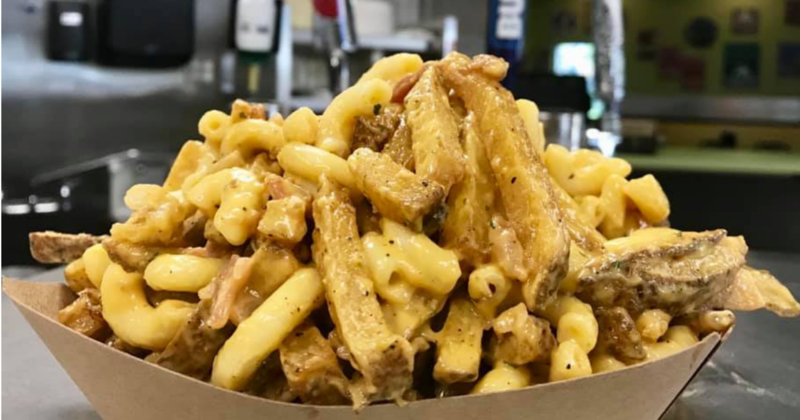 When a customer asked the restaurant’s owner to add cheese curds to his fries, the owner replied – in French, of course — but here’s the translation: “That’s going to make a dreadful mess.” And we want to add to that – a delicious dreadful mess that our customers can’t get enough of! How Do You Pronounce Poutine? When you’re craving the best comfort food, check out the poutine on our menu: Hand-cut fries smothered in our house-made gravy, that’s right… smothered! And topped with cheese curds! Boom! Feel free to add any other toppings. We love when customers come in and order our poutine fries. It’s listed on the menu under snack packs and we just know they’ll be back for more. 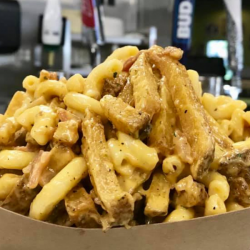 When you google the phrase poutine near me – your phone will scream – DogHouse Pizza, where you’ll find mouthwatering poutine in Melbourne. Our poutine is lit! Try it with our BLT, cheeseburger, or Gyro. Come dine with us! We’re always serving up good food and good vibes! No worries, if you’re not in the mood to leave your house, but you’re still craving our amazing food. You can call in your order and either come in and pick it up or have your food delivered. We have so many awesome dishes on our menu. We’re going to be honest – it can be hard to choose. And in case you haven’t already done so, you MUST taste our poutine. You’ll never look at French fries the same again.